A town within a city, Motor City is a short (nowadays) commute to Sheikh Zayed Road's business districts e.g. DIFC with easy access to all arterial routes. In the good old days (well, ok, a few years ago) Motor City was on the outskirts of Dubai but with the fabulous new roads and infrastructure Motor City is now in the heady position of being located on a great junction where it takes you five minutes, at most, to get to any one of the main arterial routes and only 15 minutes to Sheikh Zayed Road via Umm Suqiem Road with its new 80 kph speed limit – so be careful. Dubai Sports City is five minutes away and has many sporting facilities including a cricket ground and a recently opened fitness centre with a 50 metre swimming pool (get out there now!) Oh, and we hear there’s a bar in Sports City 🙂 something to do with football. It’s a little town within a growing city. This area is known as Uptown Motor City. On one side of its main street is the Autodrome and on the other, lots of shops at street level and apartments above. The shops include a huge Spinneys (imagine a Sainsburys), coffee shops including Caribou, Starbucks and Neros, Mashreq Bank, RAKBANK ATM, a massage centre and various other outlets. GEMS new school – Metropole is very close to Spinneys. Two other schools are opening this year (2015) – King’s and Safa Community School which are very close by. Foremarke School is between Hessa Street and Umm Suqiem Road – closer to that end. 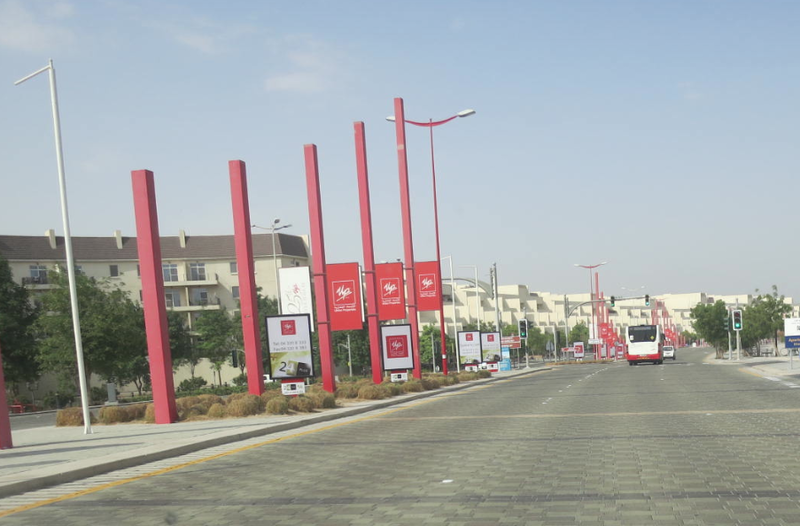 There’s also a nursery – Jebel Ali – close to the Barton House developments to the rear of the main street. Sadly, the Motor City Team Park was affected by the credit crunch in 2008. At the entrance of Motor City stands a sad reminder of these problematic days. An unfinished hotel and the team park. The developers, Union Properties (UP) have their finger on the buzzer and are enthusiastic about the new buildings and services offered in Motor City and are, no doubt, pushing for this ‘blot on the horizon’ to be revived and the development finished. All in all, a nice place for families with an easy walk to the shops. Security to all apartment blocks is strict, operating 24/7. By the way, just because there’s security in place does not mean there are any security issues. The uniformed security guys give you peace of mind that any unwanted visitors are turned away. They will also help you with directions and other local information. Security will also help you move in and out of your apartment – you will need written approval so check with them what’s required. If this is somewhere you would like to move to, you need to get over a few hurdles. First of all, regardless of what the real estate agent might tell you, there is a procedure for a truckload of your belongings, or any other large delivery/collection. You need to complete the first section of the ‘move in/move out’ form (collect from security), sign both sheets, produce a copy of your passport and visa and give to security. They will complete the other information when the delivery/collection has taken place. So, you’re through the door and you’ve connected DEWA (electricity and water provider) but what about air conditioning. Motor City’s air conditioning service is operated by Emicool. You will need to visit Emicool’s offices in Motor City to organise air conditioning in your property. It seems to be a pretty efficient service and there are deposits to be paid so read the Emicool guide. Union Properties, the main developer of Motor City, have offices (blue low level building – watch you don’t miss the entrance!) on the other side of the main street, diagonally opposite Spinneys which can help with property rentals and access cards to your apartment. Go to the 2nd floor. There are other real estate agents with offices in the area but they’re all much of a muchness. If you have any maintenance problems there is a local company ‘serve u‘ which seem to do a good job of keeping things ticking over. Another company which is very efficient and turn up on time, unusual in this part of the world, is Prime Square. Do you live in Motor City? Would you like to add information to this section? Yes? Great, contact us here, we’d love to hear from you.